Contrary to popular opinion, The Swashbuachaill is not a callous sort though it may well appear so, such is the lack of attention or care devoted to this poor old site. But in fact, The Swashbuachaill is writing all the time, churning out the paid-for stuff that foots the bills, so will endeavour to regularly post links to aforementioned scribblings until such time as his carefully wrought investment strategies* come to fruition enabling him to retire entirely from the world of hard labour and solely dedicate himself to his dear, dear reader/s. Which brings me to the cover story in last Saturday’s Irish Examiner Weekend magazine, a feature I wrote about my great culinary hero, Myrtle Allen, who is 90 years of age on March 13, in this year, the 50th anniversary of Ballymaloe House as a restaurant. Imagine, a farmer’s wife, 40 years old with six children, the youngest just three, and she decides to open a restaurant in her front room with no formal culinary training save a series of night classes in the Cork College of Commerce. Just over a decade later, she has a Michelin star but, without doubt, the even greater achievement was introducing and standing by her culinary philosophy, whereby she saw it as a chef’s duty to use the very finest of local, seasonal produce and, dispensing with ego and the panoply of ‘cheffy’ tricks and techniques that so often disguise inferior ingredients, to allow this food the star turn on the plate. It is a philosophy that the late Chef Gerry Galvin, dubbed ‘revolutionary’ at the time but is now accepted best practice the world over and, in the culinary world, her renown—very rightly!—is global. Happy Birthday, Myrtle! 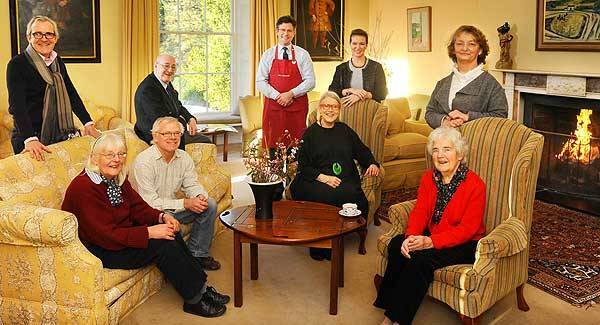 This entry was posted in Cork, Food & Drink, Published/Media, Restaurants and tagged Ballymaloe House, Darina Allen, Hazel Allen, Michelin Star, Myrtle Allen, Rachel Allen, Rory O'Connell.